You said on the College of Wooster website that the Icelandic flexure zones are dipping to a magmatic chamber. Is that chamber what fuels Iceland’s volcanoes? Do these flexure zones make fissures? And it seems that these huge folds have to disturb the rocks, so why are there so few earthquakes in Iceland? You also say that we can use this to learn how oceanic crust is formed? Don’t we already know how? Isn’t the sea-floor spreading how the crust is formed? Or are you trying to figure out how the ORIGINAL crust formed? Because figuring out the ORIGINAL crust sounds like it would be really fun. Last question: Can you monitor the flexure zone’s movement? And if you can, can you use that data to predict volcanic eruptions, if the flexure zones and volcanoes are somehow related? I’ll do my best to answer all of your questions, Leo, but first, let’s chat for a bit about the geology of Iceland. Iceland is unique because it is a hotspot (an area of very high volcanic activity) that straddles the Mid-Atlantic Ridge (a divergent plate boundary). The Reykjanes and Kolbeinsey Ridges extend onshore in the southern and northern parts of Iceland, respectively. Through Iceland, the divergent plate boundary is shifted to the east, where it sits on top of the Iceland Plume. The rift wasn’t always in this location, though. The picture below shows the rift today (1n and 1v), the future rift (4), and the rifts that used to be located in the western part of the island (2 and 3). The Western Rift Zone (1v) and Northern Rift Zone (1n) are active today. The Eastern Volcanic Zone (4) is starting to become more active. The Westfjords Rift Zone (3) was active until about 15 million years ago, when the rift migrated to the Snaefellsnes-Skagi Rift Zone (2). The Snaefellsnes-Skagi Rift Zone was active until about 7 million years ago, when the rift reorganized into the present-day configuration. Flexure zones, which develop as a result of seafloor spreading, are one of the reasons that scientists know the position of the ancient rifts. As you already know, Leo, the plates diverge at mid-ocean ridges, and the underlying mantle ascends, melts, and transforms into magma. The magma either cools slowly (creating a rock called gabbro, which makes up the thickest and deepest part of the ocean crust) or rises up to the surface (through conduits called dikes) and erupts on the seafloor as mid-ocean ridge basalt (MORB). As the mantle rises beneath a mid-ocean ridge, it melts, creating magma. The magma that cools slowly in the crust forms a thick layer of gabbro. The magma that rises up through dikes and erupts on the seafloor creates the uppermost extrusive portion of the crust. As you can imagine, a lot of MORB lava is erupted right at the mid-ocean ridge axis. So, early lava flows tend to be buried by later lava flows. As the lavas are buried, they tilt toward the ridge axis, creating a flexure zone. The picture below shows a side-view of a flexure zone. The mid-ocean ridge axis is in the middle of the pink lavas, which have buried the gray lavas, which have buried the green lavas, which have buried the blue lavas. Side-view of a flexure zone showing lavas that dip toward the mid-ocean ridge axis (center). After Dowland, 2003. So yes, flexure zones dip toward the magma chamber, and yes, magma chambers fuel volcanoes. However, the flexure zone that I’ve worked on is part of the Snaefellsnes-Skagi Rift Zone (#2), which went extinct about 7 million years ago, so its magma chamber is long gone. Do these flexure zones make fissures? Not exactly. Fissures typically develop above magma that is moving around in subsurface dikes. Sometimes, the magma reaches the surface and creates a fissure eruption, like the one pictured below. Can you monitor the flexure zone’s movement? And if you can, can you use that data to predict volcanic eruptions, if the flexure zones and volcanoes are somehow related? Good question. Geologists definitely monitor ground movements around volcanoes in an effort to understand when they might erupt, although most of the instruments measure changes to the surface of the volcano. You can find more information about volcano monitoring at the USGS website. And it seems that these huge folds have to disturb the rocks, so why are there so few earthquakes in Iceland? You might be surprised by the number of earthquakes in Iceland. You can get up-to-the-minute information about Icelandic earthquakes at the website for the Icelandic Meteorological Office. The map below shows all of the earthquakes that occurred in Iceland over the 48 hours before this blog post. 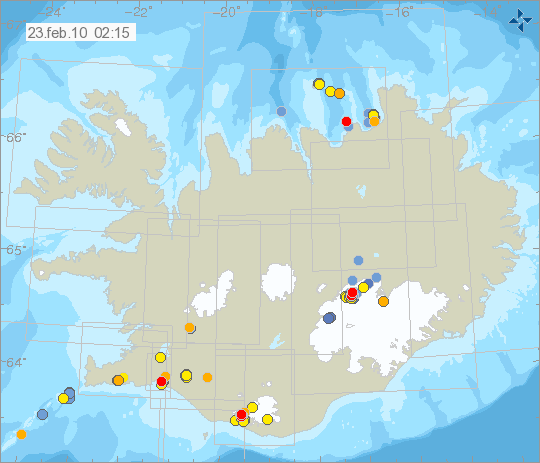 You can see that most of the earthquakes are located in the active rift zone or in the South Iceland Seismic Zone. Earthquakes in Iceland over the past 48 hours. Red indicates 0-4 hours old; orange is 4-12 hours; yellow is 12-24 hours; light blue is 24-36 hours; dark blue is 36-48 hours. You also say that we can use this to learn how oceanic crust is formed? Don’t we already know how? Isn’t the sea-floor spreading how the crust is formed? Yes, the ocean crust is formed through seafloor spreading, but we don’t know all the details about seafloor spreading yet. For example, there are a lot of questions about how the flexure zones form. How quickly are lavas buried? How deeply are lavas buried? How much of the flexure zone forms near the axis? How much forms far away from the axis? Are the lavas slipping on one another (like a deck of cards)? We have ideas about these questions, but we really need to do more research to understand the details. I hope I answered your questions, Leo. Thanks for the email! Good luck on your research project! CLEVELAND, OHIO–Yesterday the Wooster Geology Club, under the able direction of Dr. Meagen Pollock, visited the Cleveland Museum of Natural History for a behind-the-scenes geological (and, it turned out, biological) tour. The weather was fantastic for the drive north as we broke free from the snowy confines of campus. We were met by Dr. David Saja, the CMNH mineralogy curator, and Dr. Joe Hannibal, the CMNH invertebrate paleontology curator. The public galleries were crowded with families since it was “Scout Day”, so we were happy to be plucked from the long entrance line and taken to the quiet laboratories downstairs. Dr. Saja and Dr. Hannibal spent hours with us showing the collections and equipment, and we came away with new ideas for collaborative research, student opportunities, and our own specimen displays. It was a delightful day. Dr. Saja showing us the CMNH mineralogy collections and research facilities. Dr. Hannibal discussing the beautiful skeleton of a Devonian fish from the Cleveland Shale. Geology Club president Rob Lydell tests the reaction speed of a Devonian Dunkleosteus fish. Very slow, it turns out. Editor’s note: Senior Independent Study (I.S.) is a year-long program at The College of Wooster in which each student completes a research project and thesis with a faculty mentor. We particularly enjoy I.S. in the Geology Department because there are so many cool things to do for both the faculty advisor and the student. We are now posting abstracts of each study as they become available. The following was written by Rob McConnell, a senior geology major from Darby, Montana. Here is a link to his final PowerPoint presentation on this project. In the summer of 2009, Wooster paleontologists Dr. Mark Wilson, Palmer Shonk, and I traveled to Estonia with fellow Ohio State University paleontologist Dr. Bill Ausich. Olev Vinn of the University of Tartu greeted us at the Tallinn Airport. We then proceeded by car to the island of Saaremaa in western Estonia. The city of Kuressaare would serve as our home for the next week as we conducted our research on the island. My research describes two members of the Jaani Formation (Silurian, Wenlock): the older Mustjala Member and the younger Ninase Member. Samples of these two members were collected from three sites along the northern Saaremaa coast: Liiva Cliff, Suuriku Cliff, and Panga Cliff (Figure 1). Figure 1. Jaani Formation at Panga Cliff, Saaremaa, Estonia. The purpose of my research is to describe and recreate the paleoenvironment of the Jaani Formation. I am doing this by analyzing thin-section slides, stromatoporoid sponges (Figure 2), and various other fossils such as corals and brachiopods. It appears thus far that the lower Mustjala Member is far more fossiliferous and contains larger stromatoporoids, many of which are still in life position. This indicates a tranquil shallow marine environment. Smaller and flatter sponges are found in the upper Mustjala Member, close to the Mustjala/Ninase boundary. This is likely because of a shallowing of the water through time (a regression). Figure 2. Stromatoporoids from the Mustjala Member, Jaani Formation (Silurian, Wenlock) on Saaremaa, Estonia. The Ninase Member has different characteristics than the Mustjala. In general, it is better cemented and contains fewer fossils. It also contains more brachiopods and fewer sponges. It may have been deposited in a higher energy environment. Continued analysis of both members is required to gain a better understanding of this approximately 420 million year old environment. Editor’s note: Senior Independent Study (I.S.) is a year-long program at The College of Wooster in which each student completes a research project and thesis with a faculty mentor. We particularly enjoy I.S. in the Geology Department because there are so many cool things to do for both the faculty advisor and the student. We are now posting abstracts of each study as they become available. The following was written by Palmer Shonk, a senior geology major from Dublin, New Hampshire. Here is a link to his final PowerPoint presentation on this project. I traveled to Estonia in July of 2009 with my advisor, Dr. Mark Wilson, Dr. Bill Ausich of The Ohio State University, and fellow Wooster geology major Robert McConnell. Upon arrival, we were greeted by Dr. Olev Vinn, his wife Ingrid, and their baby daughter. Olev is a geology professor at Tartu University in Estonia. The seven of us then headed for the island of Saaremaa, where I carried out my research. We stayed in the town of Kuressaare, on the southern shore of the island. My field site, the Äigu Beds, is about a 20 minute drive southwest of Kuressaare, on the western shore of the Sõrve Peninsula. The Äigu Beds (Figure 1) are part of the Kaugatuma formation, named after the nearby town of Kaugatuma. My goal is to use the fossils and lithology at the beds to reconstruct an environment 418 million years old. My group assisted me in collecting fossils from three distinct layers. 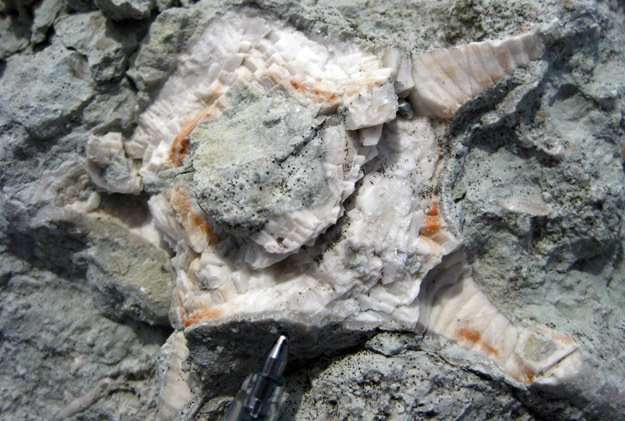 The first layer, about 8 cm thick, is an argillaceous limestone and contains many fossils still in life position, particularly crinoid holdfasts (Figure 2). This layer represents a calm, shallow-marine environment with soft, submarine dunes. The second layer, about 17 cm thick, shows evidence of a high energy event such as a storm. Fossils in the second layer have been crushed and are cemented together. 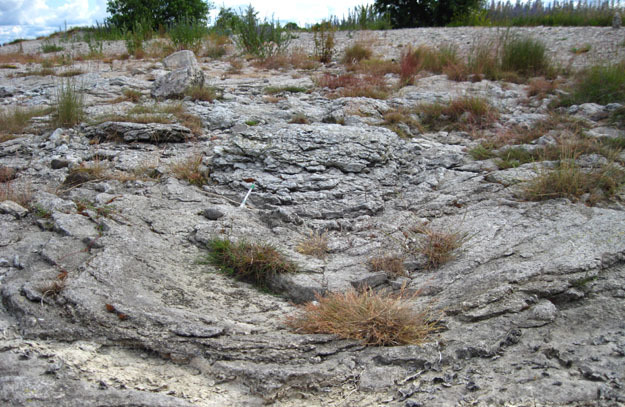 The third layer, about 30 cm thick, is comprised again of the argillaceous limestone of layer one, but also shows evidence of a small scale high-energy event due to its “mashed” fossil specimens. Figure 1. Part of the Äigu Beds on Saaremaa Island, Estonia; Late Silurian in age; note green pen for scale. Figure 2. Crinoid holdfast from the first layer at the Äigu Beds; note tip of pen for scale. 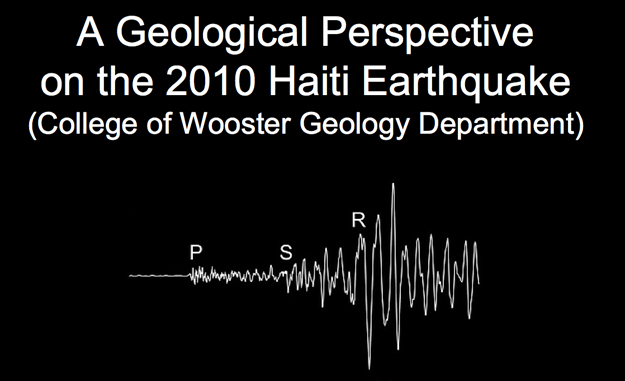 WOOSTER, OHIO–The Wooster Geology Department faculty spoke today to the campus about the geological framework of the cataclysmic January 2010 earthquake near Port-au-Prince, Haiti. Greg Wiles started with an overview of plate tectonic theory and how the dynamic Earth makes earthquakes inevitable. Meagen Pollock discussed the mechanics and measurements of earthquakes and why they can cause so much damage. Shelley Judge explained the particular Caribbean fault system which produced the Haiti earthquake. Mark Wilson then finished with a review of the historical major earthquakes along that fault zone. You can view their Haiti Earthquake PowerPoint slide presentation here.